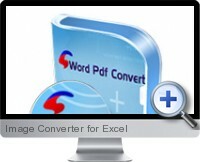 The Image Converter for Excel exports a variety image formats effortlessly from Excel documents. The Image Converter can batch convert different Excel document formats to any image format in one process at high speed and with excellent image quality. The batch Image Converter for Excel is ideal for preparing presentations and slide shows based on Excel data from multiple sources. Batch converts multiple Excel documents to multiple images in one step. High performance and excellent quality of output images. Embedded menu options and help.